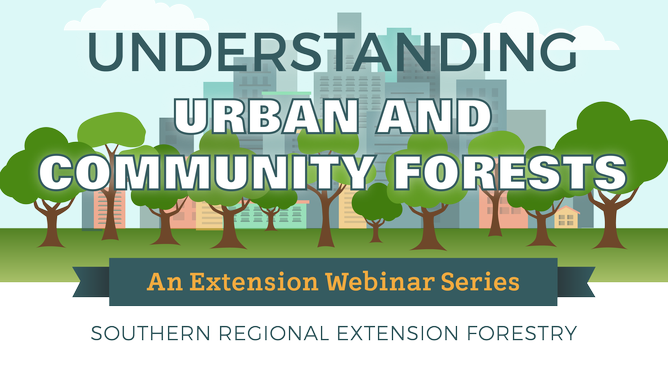 Join Cooperative Extension personnel, educators and a large cadre of expert speakers for an exciting and knowledge-filled urban and community forestry webinar series. Topics covered include the effects of urban forests on our health, creating storm-resilient forests, pollinator habitats, common insect pests, and more. This free series was developed by Southern Regional Extension Forestry with input from southeastern Extension and Outreach urban forestry experts. The 12 webinars aim to increase knowledge and provide resources to support educational programming across the southeast. Planning partners for this webinar series include: Southern Regional Extension Forestry, University of Georgia Outreach & Extension, Virginia Tech Extension, Clemson University Extension, University of Florida Extension IFAS, Mississippi State University Extension, University of Arkansas Extension, University of Washington, Penn State University Extension, University of Wisconsin-Stevens Point, and Trees Virginia. Please contact Holly Campbell, Extension Associate with Southern Regional Extension Forestry, for more information or any questions.